Per bend sinister Or and azure, a bend sinister embattled sable between a griffin segreant gules and two key in saltire, wards to chief, loops connected by a chain, Or. Throughout my SCA life I've been interested in various periods and times. I started as a Russian from about the late 11th century. From there to a 1500's Scot. To a Venetian Gunner, to a late 1300, early 1400s English cannoneer, and now happily ensconced somewhere in the north of europe around the 10th century. Dates are approximation I need to do a little more research. During my tenure as baronial exchequer I did reservations and ran gate for most events that were run in barony. 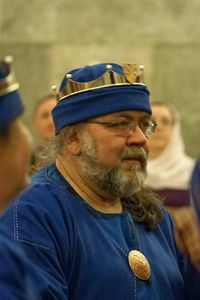 I've been involved with the cannons at pennsic making things go boom since the early 90's, I own my own cannon named "cricket" and am a master gunner of the guild of St Barbara. I've dabbled in blacksmithing, woodworking and other things that have caught my interest. This page was last edited on 9 April 2019, at 08:34.